Central Minnesota Karate has been a recognized school of karate on the international level. Because of its commitment to true karate, Central Minnesota Karate has been able to host clinics by some of the world's most admirable Masters of our time. No other organization in the area holds higher recognition in Japanese karate. TRAIN WITH THE BEST, join Central Minnesota Karate. As a beginning karate student, one does not have to be overly concerned of their present physical condition to start karate training. As your technique begins to develop, so will your physical well-being. Through systematic instruction, short term goals are easily recognized and attained. You will soon be performing a unique and valuable art. Adult practitioners find it mentally stimulating and enjoy concentrating on their physical performance. Coordination, flexibility, and overall body strengthening are soon realized. 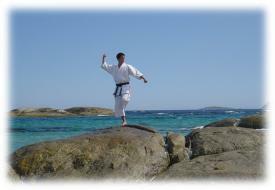 Karate training will also provide an "outlet" to release anxiety and tension that build up in our day-to-day activity. "Exercise your mind, exercise your body." Train with karate! The karate dojo (practice room) aquaints children with an innovative method of etiquette, in which, among other values, requires self-control and respect toward others. The physical and mental disciplines practiced in karate training have proved instrumental in developing strength, coordination, and endurance and also, excellent team playing skills, goal setting, and mounting self-esteem. As young practitioners mature, their karate experience will assist them in other forms of education, sports, and recreation, and of course, self-defense. A "Quality Karate Program" is essential for the youth of today. History tells us that crude forms of karate evolved from the necessity for man to defend himself. And undoubtedly, "modern day karate" is the most advanced weaponless self-defense known to man. However, for an art like this to withstand the test of time and centuries of transition, there had to be a philosophy to nurture the spirit of its practitioners. The guiding principles of karate are to develop character, be sincere, earnest, courteous, and learn self-control. Though it sounds very philosophical, these goals can only be attained by the vigorous training and discipline karate has to offer. The attitude of Masters past is maintained by Central Minnesota Karate instructors. The goals of karate today, along with self-defense and good health, are to develop human spirit, gain faith in one's self, respect others, and preserve a peaceful society. This is Karate-do ("do" means way). Central Minnesota Karate offers offical rank exams every three months for those who are interested. Tournaments in kata (form) and kumite (sparring) are held on a regular basis. Competition is exciting and a great way to test your skills. Central Minnesota Karate competitors have been very successful in regional, state and national competitions. Crime against children is on the rise. We need to protect our neighborhoods and communities. This clinic will educate children in how to "stay safe". We will discuss probable situations that kids could be confronted with. They will be active in role playing and proper response methods. What about weapons? Who can we trust? How to remember a face or an automobile? What are bad habits? How are children often deceived? These questions and more will be addressed in a fashion that will keep the kids' attention. Using visual aids, props and playing skill games will make it fun for them to "Think Safe". This clinic will educate women in realizing their own potential in physically defending oneself. Not everyone can. What are the alternatives? Explore the physical and psychological aspects of self-protection. Prevention, resourcefulness, your personality, what will work for you? This class will contain open discussion and skill practice with assertiveness training.